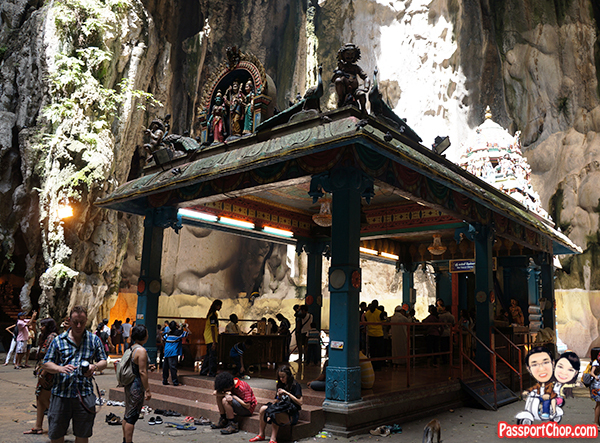 The Batu Caves is one of the most popular Hindu shrine outside India, dedicated to Lord Murugan (a Hindu deity) and at every Thaipusam (which falls in late January/early February), it will be crowded with Hindu devotees. The Batu Caves temple complex consists of three main caves (Temple Cave, Dark Cave and the Art Gallery Cave) and a few smaller ones. The biggest, referred to as Cathedral Cave or Temple Cave, has a very high 100-metre ceiling and features ornate Hindu shrines. 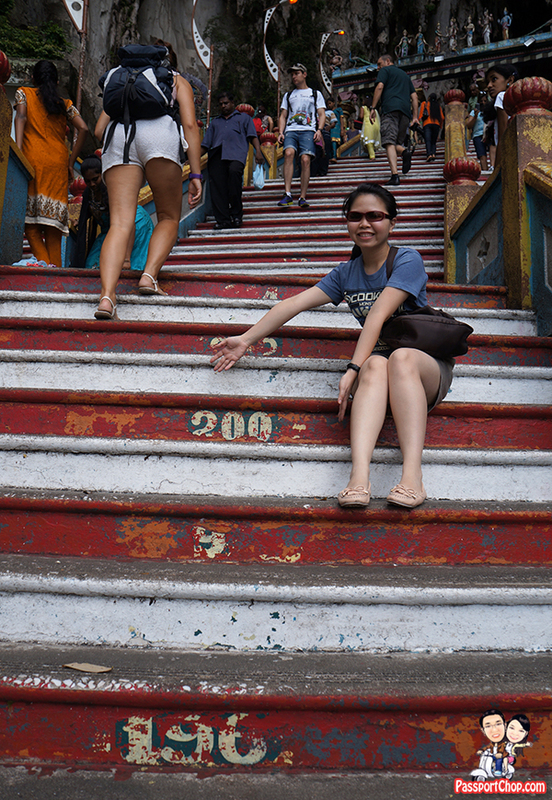 To reach it, visitors must climb a steep flight of 272 steps. So make sure you have good hiking boots for the climb. One of the most iconic feature of Batu Caves has to be the 42.7-metre high statue of Lord Murugan (tallest Lord Murugan statue in the world). The statue, which cost approximately 24 million rupees, is made of 1550 cubic metres of concrete, 250 tonnes of steel bars and 300 litres of gold paint brought in from neighbouring Thailand. This is the majestic gold statue you see in the picture below. To get to the Temple Cave, you will need to climb the steep 272 steps to the top of the Batu Caves (open daily from 7am to 7pm). 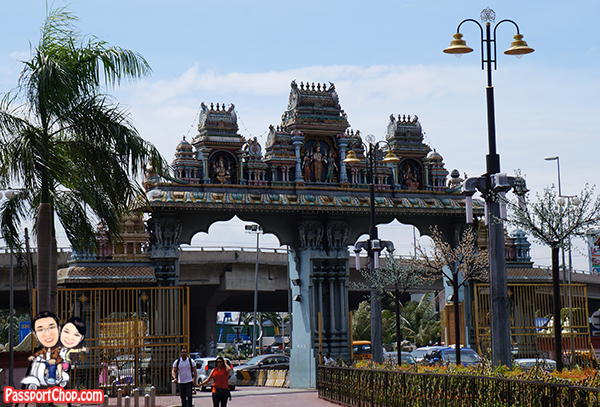 You start from the foot of Batu Caves near the foot of Lord Murugan’s statue (see picture below). Entry is free – just make sure you bring along some water and snacks for the climb up to the Temple Cave (but keep them hidden inside your bag – we will explain why later). You can buy water and snacks from shops at the Temple Cave but be prepared to be overcharged so bring your own if you can. The Art Gallery and Museum caves are at the bottom of the staircase and are filled with paintings depicting scenes from Hindu tradition and statues of Hindu deities. 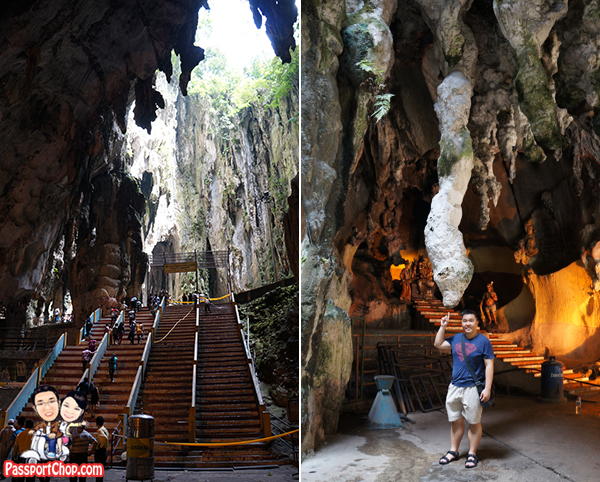 These caves have been renamed as Cave Villa and there is an entrance fee of RM15 for foreigners; RM7 for Malaysian residents. Besides the statues of Hindu deities, you will also be able to see a lake and ponds filled with hundreds of colorful koi fish, river terrapins and tortoises. We did not check out Cave Villa but do note that reviews online are not favorable – typically stating that the place is in a “deplorable state” and “not as beautiful as advertised”. 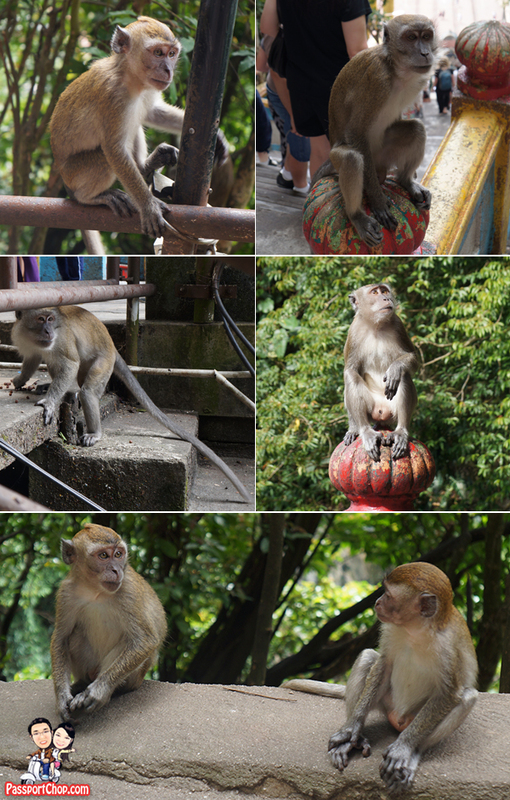 The 272 steps leading to the Temple Cave is patrolled by an army of macaque monkeys looking out for a quick snack. These monkeys make great subjects for photos, but you can be quite certain that they will end up stealing from and even biting the unsuspecting tourist. If you have food on your hands, it is almost certain that you will be marked as a potential target to attack. I have noticed that the monkeys always attack people who carry plastic bags – I think they have associated plastic bags with the food inside; although these plastic bags carry only incense offerings or some souvenir. So if you have snacks or plastic bags, keep them hidden in your bag. 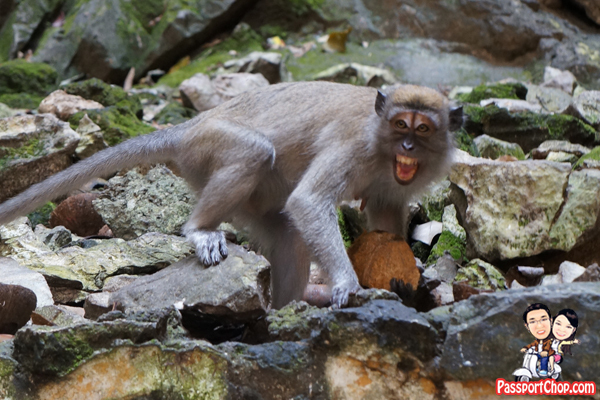 Monkey bites can be serious; immediately drop anything that they grab onto such as a backpack or water bottle. The monkeys consider tug-of-war to be a challenge and may bite your hand before they let go! When you see them baring their teeth, that means they are in an aggressive attack mode so stay away! If you start your journey up the 272 steps early (around 9 to 10am), you might not see as many monkeys – at around noon, you will see a whole army lining up along the railings – looking for their next target. 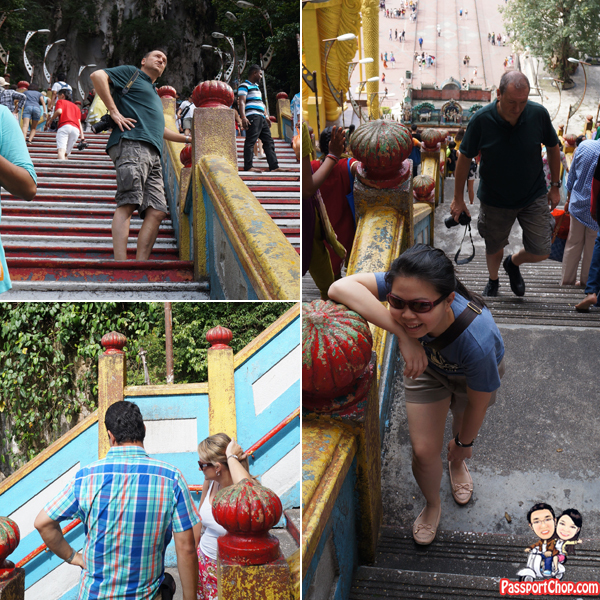 Besides monkeys, you will also see groups of exhausted visitors panting along the 272 steps – you might also be one of them – just drink lots of water and breathe…. do note that, there is no toilet facilities at the Temple Cave or Dark Cave; toilets are only available at the foot of Batu Caves! Located just below the Temple Cave is the Dark Cave, with rock formations and a number of animals found nowhere else. It is a two-kilometer network of relatively untouched caverns. Stalactites jutting from the cave’s ceiling and stalagmites rising from the floor form intricate formations such as cave curtains, flow stones, cave pearls and scallops which took thousands of years to form. Access to the Dark Cave is only allowed via guided tours – more information on this in the next blog post. The entrance to Dark Cave is around the 200th step. Resting points along the stairs provide nice views of Kuala Lumpur city and on a clear day, you can even see the iconic Petronas Tower and KL Menara Tower. 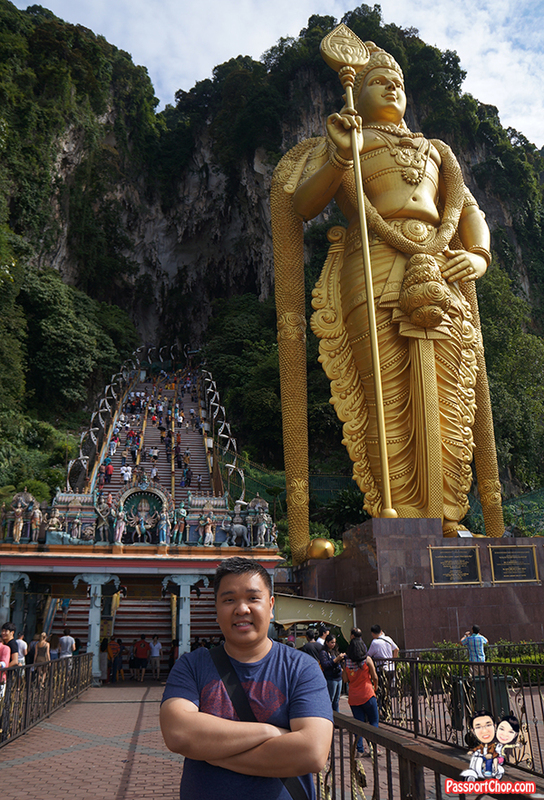 Finally after 272 steps, we reached the top of Batu Caves and into the Temple Cave. The main deity, Sri Murugan sits inside the biggest cave of a 100m vaulted ceiling of the Temple Cave. This is an impressive cave with a dome shaped ceiling. Lord Murugan’s Aarupadai Vidu known as his six famous temples based on the ancient Hindu scriptures are beautiful carved onto the walls of this cave. Within the main cave is another 2 sets of stairway with a total of 50 or so steps which leads to the upper cave where the Valli Devanai Temple is housed. From here, the only way back is down the 272 steps where you came from. There are stalls and restaurants offering Indian food outside the entrance of the Batu Caves, but make your way back to Kuala Lumpur for better quality food at lower prices. There are a lot of Batu Caves half-day tours on offer at Kuala Lumpur – there is no need to take those tours as you will be quite restricted in the time you can spend at Batu Caves and most certainly, you won’t have time to explore Dark Cave – which in my opinion, is a must-see when you are here at Batu Caves. And I am quite certain such tours will bring you for some shopping where things are likely to be overpriced and too touristy. 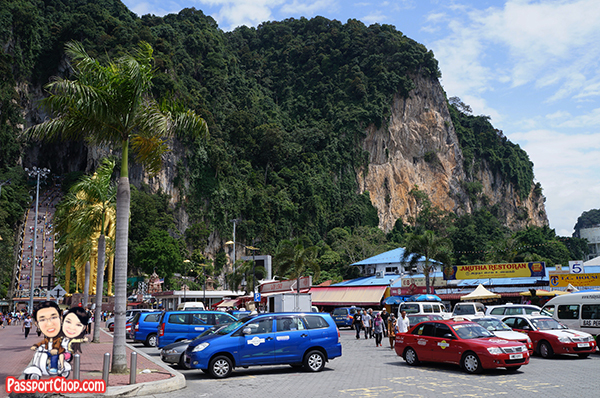 From Bukit Bintang, we took a metered budget taxi to Batu Caves for about RM 22 (one-way) – there were no traffic jam enroute to Batu Caves. Insist on taking a metered taxi – if you have to bargain with the taxi driver, try to settle on at most RM 25 – applicable only for budget taxis – executive taxis (the bigger MPV models will charge more as their metered fares are already more expensive than a budget taxi). Do note that for your journey back to Kuala Lumpur city from Batu Caves, you will almost never be able to get a taxi that agrees to turn on its meter if you take one of the taxis at the Batu Caves carpark. You will be quoted prices upwards of RM40 but if you can bargain it down to RM25 (quite unlikely), then you should proceed with it. 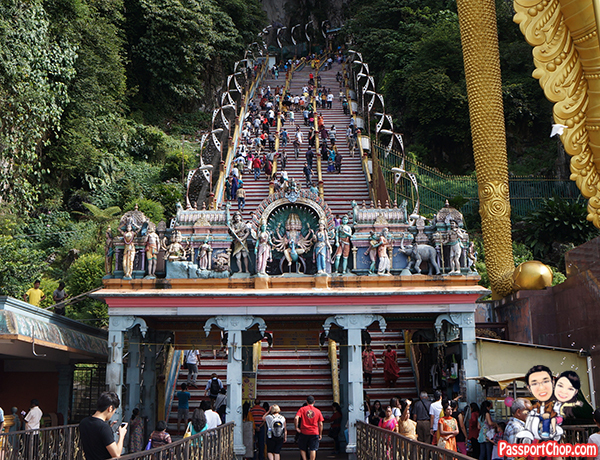 Alternatively, you can walk a bit to the main gates of Batu Caves (see picture below). Some taxis bringing visitors from Kuala Lumpur to Batu Caves will drop off their passengers there – you can then hail one of these taxis for your ride back to Kuala Lumpur. Most will agree to turn on the meter to take your fare otherwise they will be going back to Kuala Lumpur on an empty car but always check that they agree to go on metered fare before boarding. 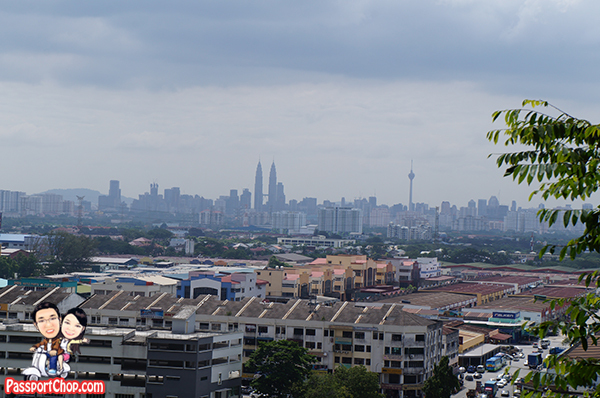 The ride back to Bukit Bintang on a metered fare should cost around RM 20 – RM 25.
thanks for the well taken photos. and the narration. it gave me good picture . Very impressive post, so thorough and comprehensive! 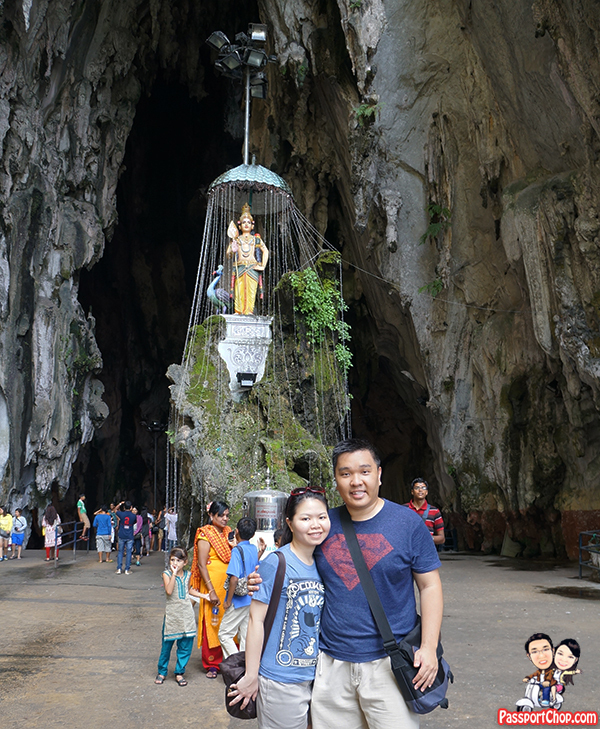 I’ve included your link to my post on Batu Caves, thanks for sharing and writing a great post! Thank you for the detailed post that is narrated well in a respectful manner. Of the several posts that I found on the internet, yours was the most informative in helping me decide whether I should visit this place. I am planning to visit from the US and will bring along some elderly relatives from India. I was worried that they will not be able to climb the stairs. I think they will enjoy the view from the base. Thanks again. I am from India m parents wants to this temple but they cannot climb by steps any other way to climb like lift,rope car or any other way. Please take. Inform. Thank you.